One of the premiere figures in Parisian bow making of the late 19th and early 20th centuries, Lamy studied with Husson and Voirin before setting up his own shop in Paris in 1885. His work was in such demand that he never had to make bows for others like most other makers of the time. 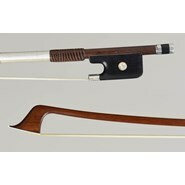 This bow is an exceptional example by this master and is in excellent condition. Victor Fetique was an exceptionally talented bowmaker, and winner of the coveted prize, "One of the Best Craftsmen of France." Originally from Mirecourt, he apprenticed with the Husson family and Charles Nicolas Bazin, before working with the newly opened Parisian firm, Caressa & Francais, in 1901. While there he worked side by side with another great archetier, Claude Thomassin. By 1913 he set up his own shop and before long started supplying large numbers of bows to the musical community of Paris, and beyond. His best work was made personally, with the assistance of great makers such as his younger brother, Jules Fetique. He trained or hired bowmakers such as his son, Marcel Fetique, Paul Weidhaas, Louis Morizot Sr., and Andre Richaume, among others. 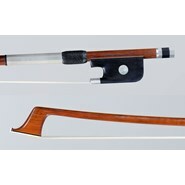 Because of his dependable quality, his bows are in high demand by top level musicians. 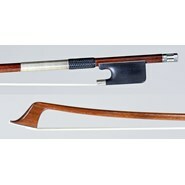 His bows are characterized by their unwavering strength and flexibility, at once clear in tone and rich with color. They are consistently easy to play, handling the versatile technical demands of concert musicians. We are delighted to have 2 of his bows right now, both of which are accompanied by a Raffin certificates. They exemplify all the playing qualities that have given Victor Fetique his great reputation. In addition to being a talented bowmaker, Andre Chardon was also a renowned violin repairman and successful businessman. He headed the family company, Chanot-Chardon, selling fine quality bows and instruments. Grandson of the great violin maker Georges Chanot, Chardon began training as a luthier with his father at the age of 15, shifting to bow making after World War I. Because the family firm occupied much of his time, he was not as prolific as many of his peers, though the quality of his production was quite high. Part of his success as a bowmaker rests upon his grandfather's collection of first rate pernambuco. This bow is strong and lively, and is accompanied by a Raffin certificate. After training with Cuniot-Hury and then C.N. Bazin around the turn of the century, he went to work with Sartory around World War I. About 1919 he set up his own shop in Mirecourt. His five sons helped him in his workshop, allowing them to supply a large number of bows to various dealers in France and beyond. One of the dealers who received bows from Morizot was the award- winning violin maker, Pierre Hel. The son of another violin maker, the famed Joseph Hel, Pierre was the official luthier to the conservatory of Lille. Edgar Bishop & Arthur Copley. Gold and silver mounted examples. 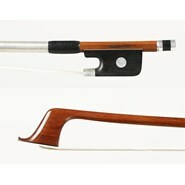 Pierre Guillaume has become one of the best known and important bow makers in the World. He studied with makers like Morizot, Bazin and Ouchard in Mirecourt. He also operates the famous Maison Bernard in Brussels. 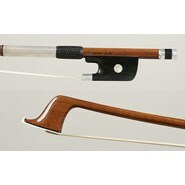 We are delighted to be able to offer these fine bows. One of the top American bowmakers today, Robert Morrow has also been a respected judge at bowmaking competitions, including the VSA. He trained with Charles Espey before setting up on his own in Port Townsend, WA. In 2008 he received the title "hors concours" at the VSA for his numerous gold medals. His work is always as elegant as it is functional, and this bow is no exception. Strong and vibrant, it is capable of drawing a huge tone from the instrument. Originally trained as a bassist, Dignan graduated from the Berklee College of Music before studying bow making. 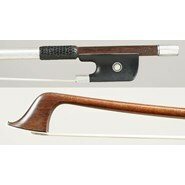 He set up shop in Boston in 1982, and continues producing bows of high quality. New York. This firm opened up in New York in 1883, a business partnership between John and William Friedrich. Originally from Germany, John Friedrich worked with several prominent German firms, including Hammig, in Leipzig. 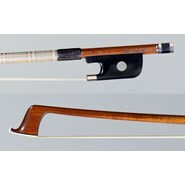 The Friedrich brothers won several prizes for their instruments in the United States, including Chicago, 1893, St. Louis, 1904, and Philadelphia, 1926. 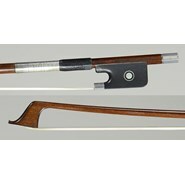 Many of their bows were imported from the finest craftsmen in Germany, including this bow. Lauxerrois began his bowmaking apprenticeship with Francois Lotte in 1947. He later went on to work as bowmaker to Marcel Vatelot in 1951, where he worked alongside Andre Chardon. 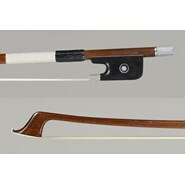 By 1980 he moved to Bordeaux where he began a prolific period of high quality bows. This bow is balanced and lively, strong but not stiff. 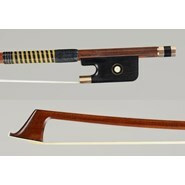 It is an excellent French bow in the old tradition at an affordable price. 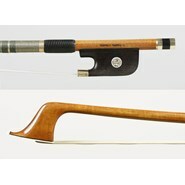 Beginning on his own in 1978, Aniano continued studying bowmaking with William Salchow in the early 1980’s. Since 2002 he has worked with the renowned Yung Chin, whom Aniano considers his principal teacher and mentor. He won prizes at the VSA, including gold medal for a cello bow in 2006 and a viola bow in 2010. This bow is his personal model, inspired by Pajeot. The stick is strong and has spring, pulling a focused sound from the instrument. Gold mounted. The son of Siegfried Finkel, and grandson of the renowned Paul Weidhaas, Johannes Finkel is a 4th generation bowmaker, highly regarded in his own right. 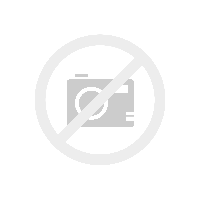 His credentials include apprenticeships and employment with Siegfried Finkel, J.A. Beare in London, Hans Weishaar in Los Angeles, and Moennig in Philadelphia. Since 1984 Finkel has run the family's workshop in Switzerland. His bows are of consistent quality following the rich tradition of his family. 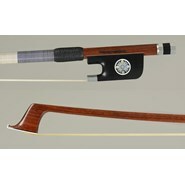 In excellent condition, this bow is responsive and powerful- an excellent value for a gold bow. Montreal. The young Emmanuel Bégin first studied with his father, the bowmaker, Louis Bégin. He also studied with Yannick Le Canu before setting up on his own in Montréal. He has won several prizes for his bows, most recently winning gold medal for his violin bow in 2014 at the Violin Society of America competition, and winning unanimous gold in 2016 for his violin, viola, and cello bows. His cello bows are a testament to his free and elegant sculpting. The bows are artfully nuanced, articulating each note with precision and clarity. Several examples. For more than 20 years, we have been the exclusive representatives of Monique Poullot’s bows in the United States. Her training can be traced back to the bow making school in Mirecourt run by Bernard Ouchard, as her first teacher was a graduate of the program. Well steeped in the traditional methods of the great French school, she has continued perfecting her craft with such masters as the renowned Stephane Tomachot. These bows are a great value for the price. Her wood selection is first rate, consistently rich in tonal properties and flexible across the strings. Her bows are excellent for any player looking for a good, modern French bow at an affordable price.